It's true. It was simply supposed to be startling and had nothing to do with "responsibility" at all. It turned out the articles were very well-received, though (well, by Ludwig anyway). "Insight into the World of Light; What Happened to Wendy and for Whom Does She Fight?" is probably in the running for one of my best ones and definitely has the best title. Still, it was written by accident. If I hadn't written it by accident, then I never would have started writing two more and my mischievous (although principled) plan never would have gone into motion. Today Ludwig wanted to do some article about George H.W. Bush and the relationship between his "thousand points of light" speech and Galeem's massacring of the Smash cast or something. ...On the day of the dude's funeral. Yeah, no. It wouldn't be the tasteless-est thing anyone here's done, but my World of Light commentary was good and I can't have its impact undermined by something clearly "title first, content second" (much like Grabbed by the Ghoulies and this is coming from a fan). See, all three of yesterday's articles didn't have titles until the last minute. One excels at alliteration and the other at rhyme, but there's a reason the other is just titled "Mii" and it's because I couldn't think of anything. Re-appropriating "Massive Melee Mythra" because they both start with "M"? Yeah, no. The fact that I just wrote the above also by complete accident makes me realize that I should probably get to the point. Well, last week the recently-appointed staffer Witch Princess, who had planned to write short stories starring the staff as a spiritual sequel of sorts to deceased staffer Vortexica's "KoopaTV Adventures", announced that her second story (following the one introducing her own person) would be one about Ludwig and Kamek getting lost or something (which...never happened). My response to that was "wtf where's the rest of the staff at?" since I was expecting for "Rawk" to debut as part of an ensemble cast because that's how he debuted in KoopaTV Adventures. If the remaining two staffers were to debut in a short story on the next Friday, on December 7th, aka the day of Super Smash Bros. Ultimate's release, then surely the short story would have to be Smash-related, right? If it wasn't, something would be bad wrong. This is when I remembered a video I made weeks prior that I thought would be perfect for the occasion. It came as a result of me screwing around with "Shulk has a World of Light Vision" footage where a MapleStory 2-playing Wendy gets Galeem Beamed at the end, and it made for a pretty interesting Smash-related prologue when you think about where Wendy would be banished afterwards. My plan was to submit the plot premise with necessary details to Witch and allow her to do with it as she pleased, except yeah, I accidentally wrote something a whole article in length. 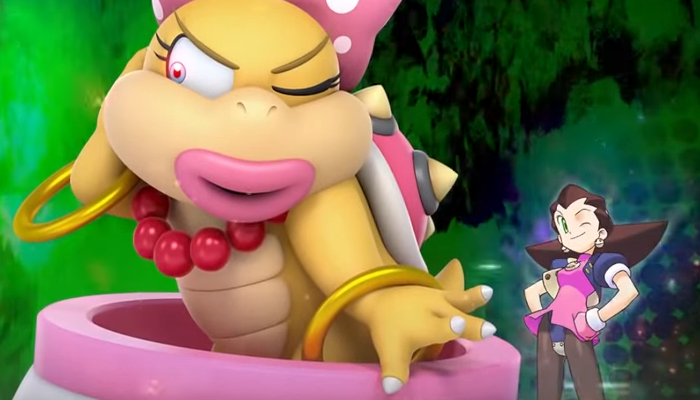 Worse yet, I suddenly remembered Tron Bonne and Tron Bonne's uncanny resemblance to her spirit medium, and how when I first saw it a few weeks ago I almost did a spit take. Was I really going to be like "Yo I really encourage spending adequate time on Tron Bonne's possession of Wendy and then making all these gaming commentary-based comparisons between the two!"? By then I had already written everything! This got the ball rolling for that article in particular, and that article got the ball rolling for two more. On one hand Witch triggered it, but on the other hand my insistence on using that video for something (which I thought would otherwise have no real purpose) was what motivated me to seek out a collaboration in the first place. You might say it was the fault of the popular "Shulk World of Light Vision" meme and my hopping on the train of it...except not really, because if that was the CASE (no pun intended, you'll see) then I wouldn't have already been doing things with Visions. Anyway, consider that Shulk capped off the other two articles (as opposed to starting them) without it being my intent and I think it's clear that it's all Shulk's fault. Or credit, whatever. 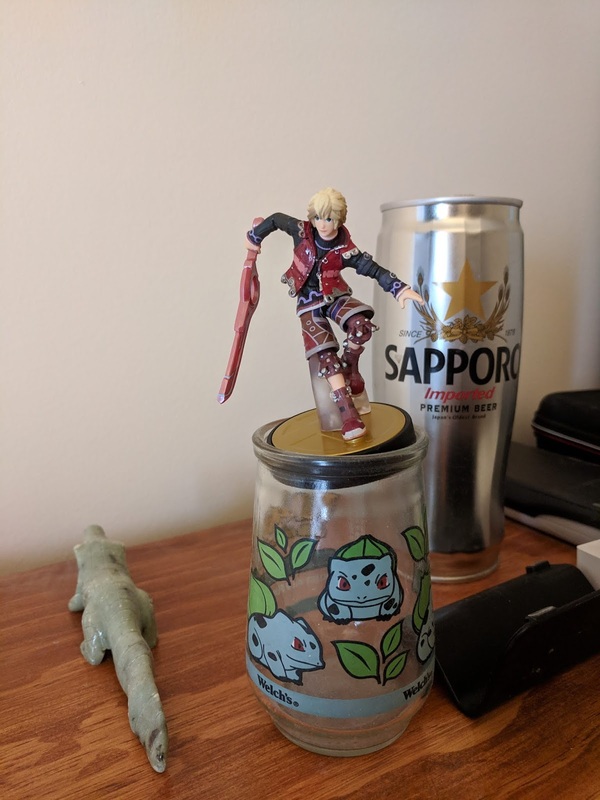 A Shulk amiibo saved my Mii from a certain ill fate and Shulk BACK SLASHing Bowser in a Smash 4 trailer justified my argument for why Xenoblade characters would continue to go after him. Shulk is the solitary thread that ties all three articles together. Hey, I'm not even that fond of the character. I actually actively disliked him before playing Xenoblade Chronicles 1 (which I only did after him and Fiora became Blades in Xenoblade Chronicles 2) because I viewed him as the "Gen 1 Pokémon" of Xenoblade Chronicles who would keep better Xenoblade characters like Nia and Malos from getting the respect they oh so deservedly deserve. He's aight though. He's a studious mechanic without taste buds and with a fear of caterpillars. We need more protagonists with that level of characterization. Even if you don't like Shulk, everyone on KoopaTV likes Kirby characters! Look at Monado Kirby go. It probably goes without saying but Shulk will likely be my Ultimate main...at least when I feel like thinking. He's a character you can never turn your brain off while using (unless you disregard Monado Arts and then why would you even be using him in the first place?) and I think he's unique in that regard. I guess I'll finally have a use for this amiibo too...and that's nice, because so far "Monadocado" aka "I'M REALLY SEALING IT!" (name wouldn't fit) hasn't had a very fun time. It's actually been quite awful. Don't worry, "I'M REALLY SEALING IT!"! Only 24 hours to go! 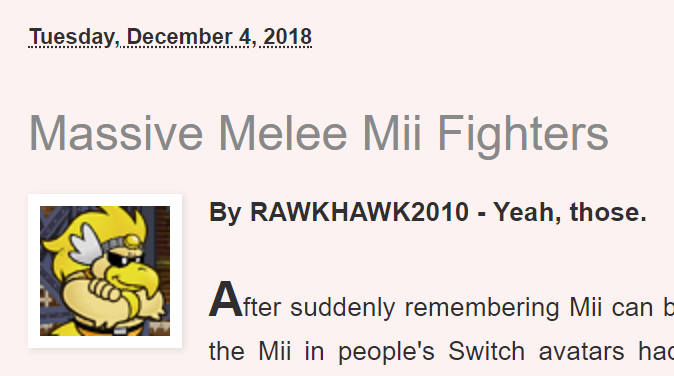 This is Rawk's fourth article in a row in the span of two days. You could say he's got a good rhythm going. If the entire franchise remained an exclusive at GameStop forever, Rawk would've never played Xenoblade Chronicles. 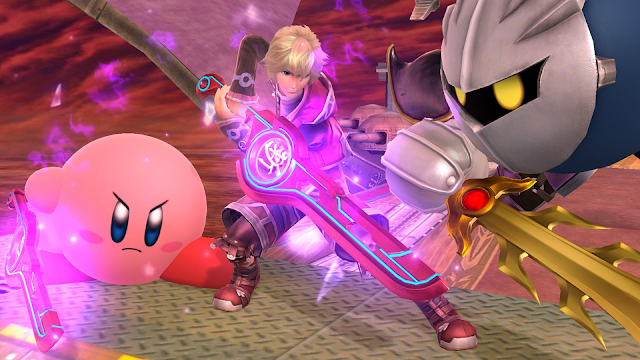 Speaking of Shulk being akin to a Pokémon... here's a whole article on that. "Today Ludwig wanted to do some article about George H.W. Bush and the relationship between his "thousand points of light" speech and Galeem's massacring of the Smash cast or something. ...On the day of the dude's funeral." That would still be a much better article for Wednesday than whatever unorganised mess you published instead!